Jon teaches out of his music studio in the Madison Plaza, downtown Corvallis. 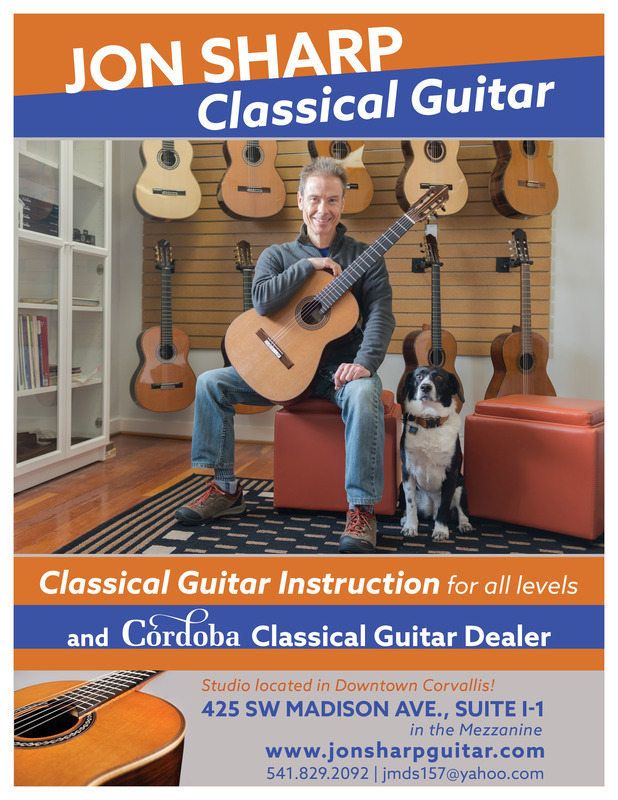 Prior to moving to Oregon, he taught beginning and intermediate adult group guitar classes with the East San Jose Union High School District for a number of years and has taught privately for over a decade catering to students from 8 years to 70 years of age. repertoire with appropriate technique building exercises and is anchored with method books selected to meet your needs as a student. This provides a systematic approach to reading music and understanding music theory. A typical weekly lesson will include practical exercises to build technique, develop music reading skills, and work on prepared pieces. Lessons cost $45 for 1 hour and $25 for 30 mins. Remember, for younger people, music and playing the guitar can provide a lifetime of enjoyment. For older people, it’s never too late to learn! ← Jon Sharp playing Julia Florida by Augustin Barrios Mangoré (1885 – 1944).